Best baby onesies for Basketball Fans!!! Last summer the world of Basketball was paralyzed with one of the best finals in the NBA History, The Dallas Mavericks nocked out the Miami Heat in the 6th game of the series best of seventh; everyone will remember how Lebron James did not scored much in the fourth quarters of these finals with a fatal breakdowns. or how D-Wade and Lebron made fun of Dirk illenes after game 5. At the end of the day, The Mavs put away the Miami Heat and earned the franchise its first NBA Champion. Dallas Mavericks is the champion (2010 – 2011) and, if you are a NBA fan you should check some of the most special gears for your little baby. This lens is create for all Dallas Mavericks Fans around the world who enjoy and support the best team in the 2011 NBA Finals. Below you will find the best designs for Dallas Mavericks fans, Lebron James Haters and Los Angeles Lakers haters. Please Enjoy this lens and our best personalized baby onesies. Perfect for Crazy Dallas Mavericks Mom!! I swear your little one love to use it every game!! This unique personalized baby onesie is 5 oz., 100% combed ringspun cotton. 1×1 baby rib. Double-needle ribbed binding on neck, armholes, shoulders and bottom. Reinforced three-snap closure. Flatlock seams. (White is sewn with 100% cotton thread. 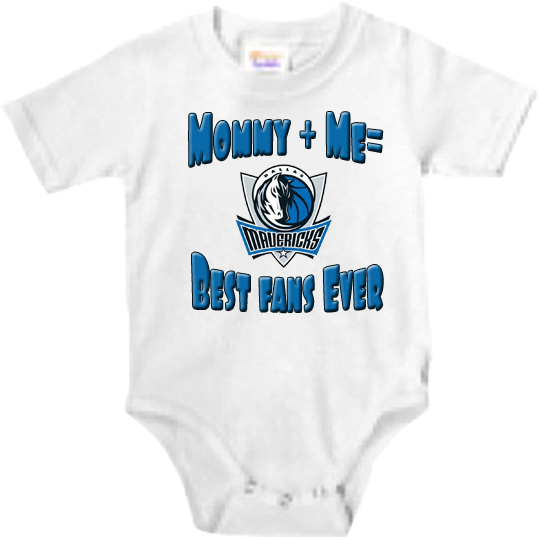 Design: mommy and me best mavs fans ever – baby onesie. You could make it with your team! !